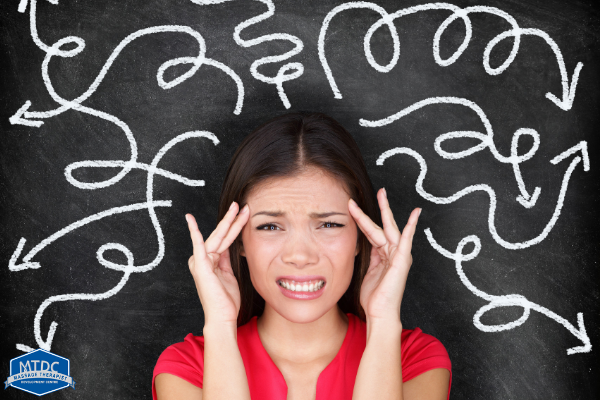 Pain Education – How Much Neuroscience Do We Really Need? In some cases, this can be sufficient to help people understand more about pain but is neuroscience ALWAYS required? Many patients may benefit from explanations that do not include information related to these aspects. Also, does a neuroscience-based approach adequately explain the EXPERIENCE of pain and acknowledge the person EXPERIENCING it? The neuroscience of pain could be explained in a standard way involving the various bits of neuroanatomy and the associated physiological processes to a room full of people, BUT if we were to interact individually with the PEOPLE in the room we may find that they have wildly varying EXPERIENCES associated with that pain. So neuroscience may explain how the sensation of pain is created, and many of the oddities that surround it, but does it fully explain the experience? Human beings, after all, are much more than the sum of their parts, and this is what makes us individuals, and does a generic universal explanation imply that pain is all the same? A neuroscience-based approach could be described as an objective view rather than a subjective one, but perhaps it is subjective that seems to most explain the impact of pain on people’s lives. A question to ponder is that if structural anatomy, and the damage to it, does not adequately explain pain does neuroanatomy and physiology? It certainly pokes holes in the common belief in a simplistic relationship between damage and pain but does it fall short in explaining the experience and the behavioral responses that have such a profound impact on the wellbeing of the person and those around them? From my perspective I want people to know that pain is MORE than just a sensation to be recorded in a score, rating or questionnaire. It is in an experience that can puncture or our existence in many ways and that many parts of our existence can affect our pain experience as well. Pain is far more than just physical, it affects our overall well-being and emotional state and this is completely NORMAL. For example, our mental health is part of our wellbeing and goes up and down in the same way that physical health does. We often place a much greater stigma on mental health though and we might need to let people know IT IS OK NOT TO BE OK with regards to this facet of their pain experience. We can feel low, worry about the implications of the pain and have greatly reduced expectations for recovery. These aspects form our individual experience and addressing these aspects for some people could be the key to their recovery. The MEANING that someone associates with pain, the emotions, and changes in behavior, the belief structures, these are the things that make the pain experience unique to the individual. These are the things that differentiate one person’s experience from another and why some can cope whilst others are disabled by pain that might be of a similar intensity. A very simple analogy ( and please remember that they are never perfect!) I use for helping people understand the different meanings people attribute to pain is that of a Petrol gauge. We could conceptualize both pain and a petrol gauge as warnings. How we respond to these warnings can be very different. In the case of the petrol gauge some people may be quite comfortable to drive on even though they have the gauge on empty, perhaps they know their car and exactly what it is capable of doing. Someone else may rush to get petrol straight away; their response to the same situation is completely different. Perhaps they have run out of petrol before and remember a bad experience? If we changed the context would that have an impact? Would the comfortable people feel different in someone’s car? One of the key aspects in the clinical encounter is the individual journey that someone has had in relation to their pain. 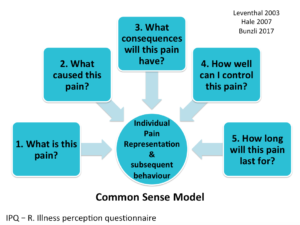 How do we use our increasing knowledge of pain to adequately explain THEIR therapeutic journey, story and ultimately their overall pain experience? Qualitative research tells us that people crave an explanation for their problems, that they want a diagnosis HERE & HERE. This is often not possible and so a narrative becomes vital and this can often involve learning more about their pain and the way it behaves. There is a huge difference between helping generate an alternative positive personal narrative and just the application of information about pain, however. 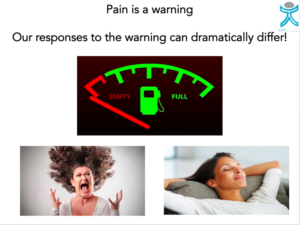 Rather than an information dump, the selective use of pain-related information should relate to something that is involved in the dialogue that is occurring between two people. A large criticism of and negative responses to medical interactions appears to be HCP’s not listening to people and talking AT them rather than to them. There is a danger of this with any application of information in a generic way. Regardless of what type of information provided, the most important thing is to create a positive experience for the person and to try to describe pain as a positive part of the human experience. After all, you would not want to live without it! Another very simple analogy I use, and of course is context dependent, is to compare pain to red wine. A glass of red wine for many is a good experience but have a bottle instead of a glass and that can be too much of a good thing, especially the next day. We would like pain at the appropriate times and the appropriate levels. With the biopsychosocial model we are opening up many new therapeutic influences and targets for treatments but amongst all these problems we can also work on things that are positive within peoples lives and in negative times, such as during pain, this may be a great way to alter someone’s current experience. This is a fantastic paper on focusing on resilience and sustainability HERE. Human beings are very complex and much more than anatomy that becomes damaged or even sensitized. 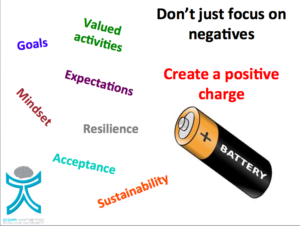 Focus on positives factors, not just negatives ones. Ben Cormack has a passion for getting people moving and using and understanding movement as an important tool to help others. Originally from a fitness background, Ben has gone on to study Sports therapy and widely in the fields of rehabilitation, pain science and movement over the last 15 years. Ben owns and runs Cor-Kinetic, an educational company who use modern research into pain, movement and neurosciences to provide a reasoning process and rehab skills to those who also place a priority on using movement and exercise as key competencies. Cor-kinetic has provided educational services for the NHS, Elite level sports clubs and universities as well as individual physio’s, Osteopaths, Chiropractors, sports therapists, rehab, and personal trainers.